My father gets a gravestone. 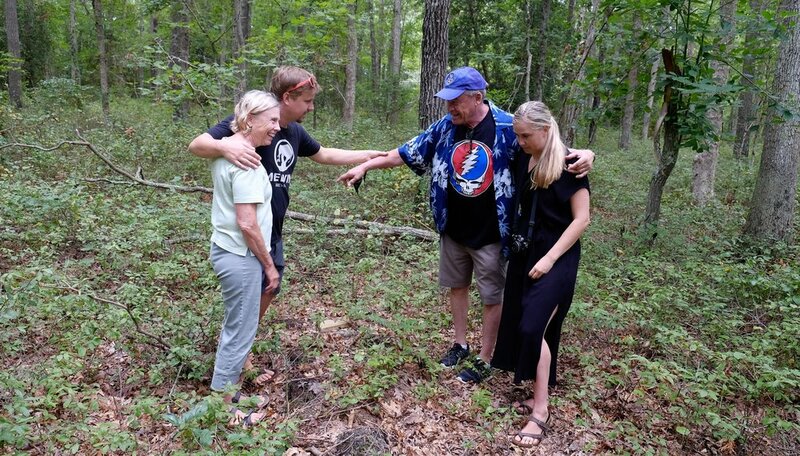 This past August marked two years since my father's death and his natural burial at Steelmantown Cemetery. I was never comfortable with deciding on a stone to define his grave; sometimes resentful that the decision was being left to me, other times ambiguous about the wisdom of marking the spot at all. It would have been easier if I’d known his wishes but the question never came up before his death. Then my brother and my niece and nephew came in from Texas wanting to visit the cemetery, full of enthusiasm. Kate missed the funeral and for the others, it was an opportunity to pay respects again. We drove down to south Jersey on a cool, cloudy day, very different from the intense heat of that other August. We've had a very wet summer and the woods look and sound different this time. I love the moss-covered paths at Steelmantown; the moss is like something laid by leprechauns or wood fairies, intensely green especially in cloudy light, and soft to the touch. My niece and nephew were enchanted, too. But the woods and winding moss-covered paths effectively hid my father's grave. 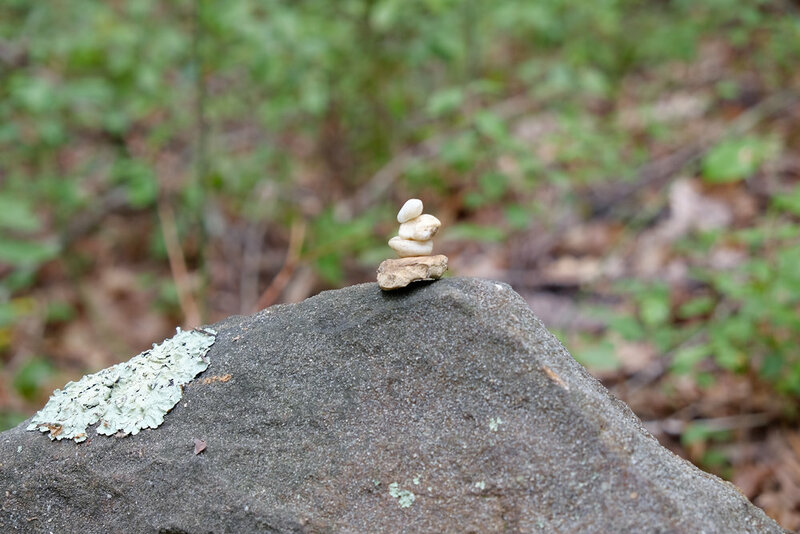 Last year Tom and I set a small rock on as a place-holder. It was a distinctive stone--brick shaped and sized out of a creamy material. But the S-curves of trail all look alike. Ed keeps a book with the exact positions of graves but he wasn't there. Could the blueberry plants have grown enough, the leaf mould piled high enough, to hide the stone? Finally I realized that the Disney-effect of the curves made the place seem larger, and I had to head farther into the cemetery. "Yep." Luckily I had a phone photo to prove it; here's the curve in that tree, there's the two trunks across the path. This is it! 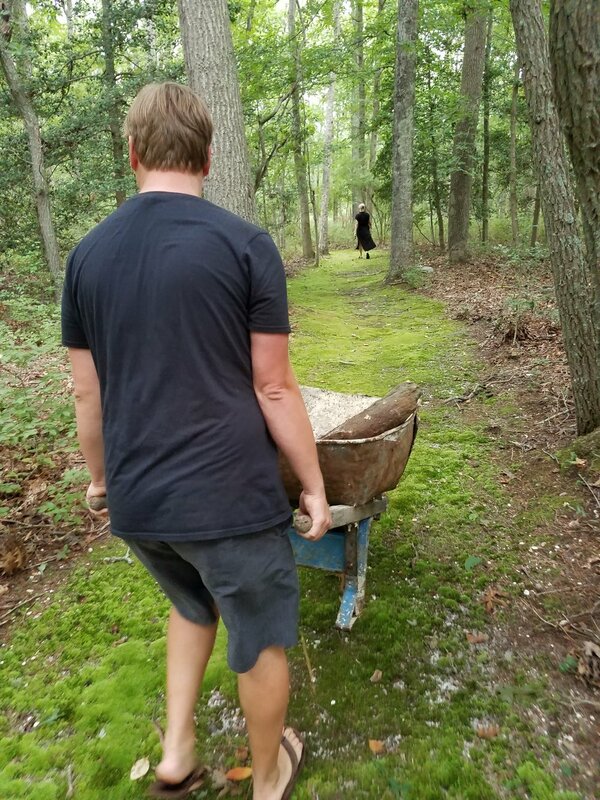 Kate had no idea what to expect, and it's fun to watch someone come to green burial for the first time. The mounded plots along the paths, the uncut stones marking chosen but unfilled graves, the birds flitting in the oaks, didn't jibe with her ideas of a cemetery. For her grandfather though, she realized, it was a good fit. Did we really almost lose his grave though? This time I agreed that a more definitive marker is necessary. Ed Bixby's assistants pile stones at the entrance to the cemetery paths, rocks dug up during trail making and grave digging, that can be used by families as grave markers. They fit the definition of "natural field stone" permitted by Steelmantown. We chose a largish brownish stone already colonized by light-green lichen, and James wheeled it back to the grave in a wheelbarrow. Kate and James wanted it to stand up, but I think the forest will bring it down in the not too distant future. We piled little stones on top and patted it. "So what do you want to say on the stone?" I asked as we walked back toward the cemetery guide, for this is the number one question that kept me from finishing the marker. Choosing a stone is, well, kind of random. But setting words to it is public. "How about Pa, engineer, father, grandfather, painter, husband," said Kate. "How about Ed Hoffner, a pretty good man?" "I'd be happy if it just said, 'Edward "Pa" Hoffner'," James admitted. As for me, I like the lichen, and the fact that when the particles that made up my father's body are finally all scattered to the forest the unengraved stone would look like it had always been there. I gave them the contact information for Ed's stone engraver. As of yet they haven't done anything about adding words. We do, however, have a gravestone. And the photographer gets photographed on the boardwalk at Ocean City (New Jersey!) after the cemetery trip. Older PostDeath and cakes in Nyack.